Hyundai will want this car to become an important part of its portfolio and take the fight to the doorstep of the Honda Amaze and Maruti Dzire who have been recently updated. We shall in the future do a comparison in which you can find out more.The current Xcent was launched at the 2014 Auto Expo and it got its facelift in 2017. The new car should have a all new platform which will be shared with Kia Motors. This new platform will be wider, offer longer wheelbase and will be more flexible. The Hyundai Xcent 2019 will offer more features and new, better performing engines too. This car is also going to be made keeping in mind the Hyundai Xcent 2019’s export to South America and other regions. Not many changes have been made to the interiors of the Xcent. Just like the Grand i10, it gets a new touchscreen infotainment system with Apple CarPlay, Android Auto and MirrorLink. The touch interface is smooth and the sound quality from the speakers is good, but what could have been better is the quality of the rear view camera which doesn’t feel up to the mark and the display ends up showing a hazy picture, especially in the dark. The infotainment system also gets voice recognition and navigation, both of which work well. Other equipment includes dual front airbags as standard, rear power socket, rear AC vents, push button start, rear defogger, cooled glovebox and a leather-wrapped steering wheel. The cabin of the Xcent feels narrow. The front seats have decent comfort and support but a size larger seats would have been appreciated. The knee room and head space at the rear is good too but again the narrow width limits some space on the inside and passengers end up sitting too close to each other. The windows are pretty large though and they end up giving an airy feel to the car. The quality inside the cabin continues to remain excellent and it has a feel-good factor to it too. With 75PS of power and 190Nm of torque at its disposal, the Xcent is now more potent than before. It’s the same 1.2-litre diesel engine offered in the updated Grand i10 and feels very similar to use. Hit the push button starter and the motor announces its awakening with a noticeable amount of vibrations that only smoothen out once you’re on the move.Once you get going, though, in mere seconds you understand that this powertrain is ideal for the city. The clutch is light and bites early, and you can crawl ahead without actually needing to use the accelerator pedal. Dab the A-pedal and progress is quick. The Xcent is, of course, heavier than the Grand i10 and the gearing does seem to have been tweaked a bit too. So while the Grand had no perceptible turbo-lag, it is noticeable in the Xcent. Understandably, it isn’t as quick as the Grand i10 with a tested 0-100kmph time of 16.20 seconds (nearly 3 seconds slower than the G10). Even the in-gear acceleration isn’t as rapid with the rise from 30-80kmph taking 9.82 seconds (1.89 seconds more than the Grand i10), but then again the Xcent is the bigger car, so the performance difference is reasonable. However, by no means is it underserved as there’s enough grunt below 2,000rpm to make smooth headway. City speeds of 40-60kmph can be hit without much throttle input, since the peak torque is delivered from as low as 1,750rpm. Thanks to the healthy low-rev performance, it’s also easy to get a good fuel efficiency figure, with our tests getting us 19.04kmpl in the city and 23.87kmpl on the highway.The best way to pick up the pace is to shift up around 2,800-3,000rpm. Revving the motor further makes it feel strained and get louder, but power tapers off quickly. There’s no use of teasing the redline with this engine and while rivals like the Aspire and Ameo offer exhilarating performance, the Xcent gives you exactly how much you need – nothing more, nothing less. There’s a healthy mid-range as well, so sharp inclines can be taken in 2nd or 3rd gear and you can let the revs drop a fair bit before the need to shift down a cog comes up. Out on the highway, the Xcent will gladly do speeds of 100-120kmph without breaking a sweat. It can go well beyond that too, but it prefers cruising at a constant speed over brief high speed runs. The snappy gearbox is great to use and the gear gates are well defined, making the Xcent pleasant to drive, if not exciting. We did, however, face some resistance while trying to slot it into reverse. The Hyundai Xcent has a soft suspension setup which results in a smooth ride for the passengers. The setup is slightly stiffer compared to the Grand i10 but the ride remains supple most of the times. However, uneven road surfaces tend to unsettle the car easily. On straights, the Xcent remains stable even at speeds well over the ton. The steering is feather light which is a boon in traffic and while parking but it lacks any sort of feel or feedback. It doesn’t even weigh up at high speeds and doesn’t instil confidence. Braking performance is sharp like other Hyundai cars and the grip from the tyres is average. 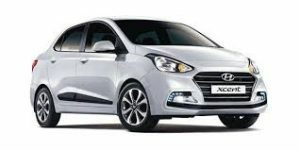 The Hyundai Xcent is a well-rounded compact sedan because it offers excellent efficiency with the diesel engine, good performance, equipment and comfort. It is backed by Hyundai’s huge after-sales network. The Xcent doesn’t really have any major downsides except the handling part and is a very good contender in the compact sedan segment and the pricing of the car is attractive enough too.